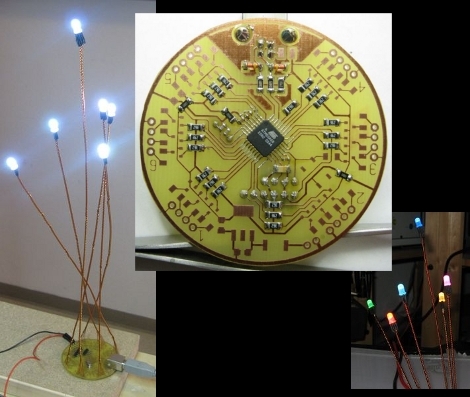 Hehe, what is the appeal of LEDs and flowers? I made an LED flower many years ago. Though I love the complexity of the control circuit on this one. 1. That’s not a hack! 3. That’s not how I would have dine it! Well thats proof you did something Uber that made them jelouse. Good job! I haven’t heard about V-USB stack before, very interesting. Ok, now that AVRs are almost impossible to buy maybe not very interesting anymore, but curious nevertheless. AVRs are almost impossible to buy? @Hackius: maybe they are recovering slowly, but in my “neck of the woods” they were really hard to obtain in 2010 and the prices were inadequate. Well, the controllers for these flowers were bought mid-2010 in the UK. The price was below 1.50 EUR, so this is okay. SMD chip versions have been the hardest to find, luckily I found a few sales and bought my own little stockpile of Atmega328s SMD and boy am I glad I did. Through hole has been pretty easy to find though. Reminds me to that pov globe. Unfortunately I dont have avr programmer in the woods either so skip building this one too. Not to mention soldering that chip would might cost 5 new chip and 2 boards until I get it right. I want this for my school project, is there any schematics available for this one? Thanks in advance.